DISCLAIMER: THIS TUTORIAL IS FOR EDUCATIONAL PURPOSES ONLY . IF ANY ONE MISUSED IT I AM NOT RESPONSIBLE FOR THAT. 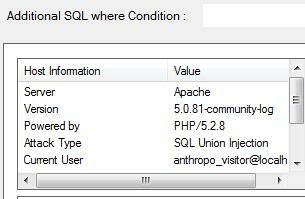 Today i am GOing to Describe What the SQL Injection IS and How It will Going to help in Hacking the Websites..
HOW TO HACK THE WEBSITES? Today I am Going to Discuss the Easiest Way to hack the Websites i.e SQL Injection Techniques. We Will Use The Software SQLI Helper to Perform This. I have provided link for software download… just read on. 1. Free DownLoad SQLI Helper to hack website. 2. Unzip the file to obtain SQLI Helper to hack website. 3. Now, when you have website hacking software, you need to find website with potential vulnerability. There are some websites that are unhackable. While finding hackable websites, it is better to search for sites with format “article.php?id=[number]” in url. If you get such error message, it is confirmed that you can hack website using this method and now you can move forward to hack website. 4. Run SQLI Helper on your Computer. 8. 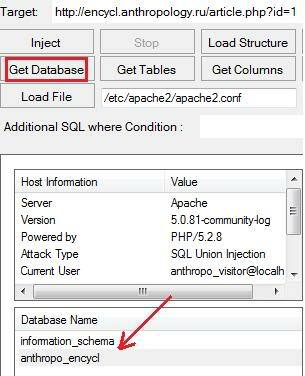 Select any element from “Database Name” and click on “Get Tables”. 9. Now, select element from table and hit on “Get Columns”. I have selected “user” to get userid and password required for login. 10. Now, when you know “user” table has columns “usr_login” and “usr_pass”, select them and hit on “Dump Now”. 12. The values achieved are actually in hash and hence you have to crack these hashes to get userlogin and password to hack website. For this, go tohttp://www.md5crack.com/ and crack the hash using “Crack that hash baby” button. Thus, you are now able to hack website as you have got website user id and password. Once, you get admin password, you can easily hack website. DON’T FORGET TO SAY THANKS !